Smart Goggles: Happy V-Day Everyone! My photography might leave something to be desired but, aside from the potatoes (which stubbornly refused to be cooked through in time to go on the table with the rest of dinner), this dinner did not. 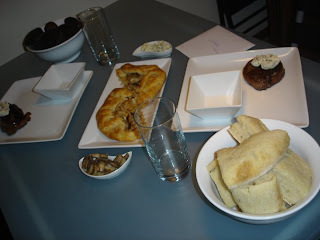 Rosemary Focaccia, a Caramelized Onion & Gruyere Gallette, Fillet with compound butter, mushrooms, blue cheese and some plain old chocolate cupcakes....we're having a happy V-day around here.